Investors should steel themselves for more “ Red October”-style market tantrums in 2019, as tighter US monetary policy once again hits bond prices and further undercuts support for financial markets, according to Franklin Templeton’s fixed income chief. Markets have been turbulent since the start of October, when a US government bond sell-off accelerated and sent global equities tumbling. They continued to see-saw lower into the end of the year. Although renewed investor fears over the health of the global economy has supported bonds again, subduing yields, the calm is unlikely to last, according to Michael Hasenstab, chief investment officer for Franklin Templeton’s global bond funds. The Federal Reserve raised interest rates for a fourth time this year in December. Although the central bank lowered its central forecast for how many times it would lift rates in 2019 from three times to two, investors have taken fright at its determination to keep tightening and shrinking its balance sheet— in spite of mounting opprobrium from president Donald Trump and choppier markets. The 10-year Treasury yield has slipped back to 2.8 per cent as investors have sought out their relative safety, and the yield on the 30-year US government debt sank below 3 per cent for the first time in almost three months on Wednesday as the Fed’s forecasts showed a lower “neutral” rate in the longer-term. Yields fall when prices rise. However, Mr Hasenstab predicts that the 10-year yield will smash past the previous high mark 3.23 per cent touched in October and climb to 4 per cent by the end of 2019, as the Fed is likely to stick to its current path rather than pause its rate increases, as many investors expect. Franklin Templeton’s bond chief argues that the combination of “slowing but not collapsing” economic growth, faster inflation and the Fed trimming its heft at a time when the US government deficit is swelling and other Treasury buyers like China are tiptoeing away will resume the sell-off. Mr Hasenstab first gained prominence for massive money-spinning bets on Hungary after the financial crisis and Ireland in the depths of Europe’s debt crisis. His performance has tailed off since, but he has bounced back in 2018 as the Fed’s interest rate increases and balance sheet shrinkage finally began to produce the turbulence he has long predicted. His main fund, the $35bn Templeton Global Bond Fund, was earlier this year battered by big investments in Argentina, but the country’s tentative stability, coupled with aggressive bets against the euro and US Treasuries has produced a 1.6 per cent gain this year. That compares with the global bond market’s 2.2 per cent loss in 2018 — one of the worst performances in decades — and puts the fund in the top decile of more than 300 similar funds tracked by Morningstar, the data provider. Costs are a key concern for airline investors, who have fretted about pilot shortages, union disputes and oil prices over the past year. But there’s a less obvious bill that they will likely face in 2019: Higher airport fees. Over the past decade, air travel has grown much faster than the economy. Yet U.S. airports’ spending on infrastructure fell 24% between 2013 and 2017 compared with the previous five-year period, according to North America’s Airports Council International. Now the infrastructure needs to catch up. 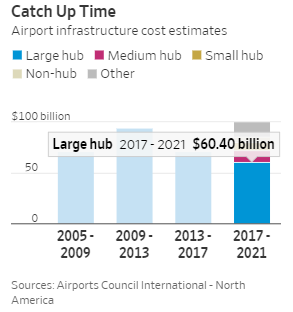 Airlines, as well as local governments and federal agencies, will invest $100 billion in U.S. airports over the next five years, ACI estimates, more than at any point on record. 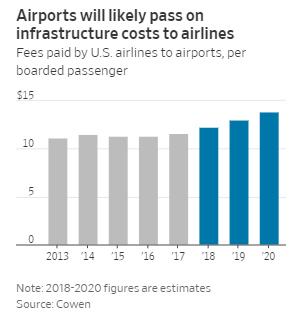 Hub airports—those used to connect flights—will spend the most, because that’s where U.S. airlines have focused their expansion. As a result, the fee paid by U.S. airlines to airports for each passenger will increase 19% between 2017 and 2020, a report by brokerage Cowen predicts. Admittedly, airport costs add up to just 2% of U.S. airlines’ total costs, on average. Fuel and labor are the key expenses, contributing more than 30% each. Yet some airlines are more exposed: Airport fees account for 4% of costs for ultralow cost carriers such as Allegiant and Spirit, which also find it harder to pass extra costs onto consumers. Meanwhile, Alaska Airlines and JetBlueare expanding in airports that are undergoing large renovations and are about to become more expensive. There’s also the risk that the final bill ends up larger than investors anticipate, even for big legacy carriers like Delta Air Lines ,United Airlines and American Airlines. Of the $100 billion of planned infrastructure spending, only 63% will be used to expand capacity, the ACI believes. That means higher investment may be needed for many years to come. A lot of resources will go to refurbishing old terminals, which have dragged down consumer satisfaction in many of the U.S.’s major hubs. A clear example is New York’s LaGuardia Airport, which could be in a “third-world country,” as then Vice President Joe Biden said in 2014. It often ranks near the bottom of airport rankings, including a recent Wall Street Journal one. Works to refurbish LaGuardia started in 2016 with an $8 billion budget. Costs per passenger for airlines could increase 37% by the time the works are done in 2023, Cowen estimates. It may be more exciting to track the price of crude every day, but airline investors should also take a close look at the number of cranes around airports. With no compromise in sight to end the federal government shutdown, and no one left in President DonaldTrump's cabinet who can restrain him, Americans and their allies are staring into the abyss that has been looming since the 2016 election. WASHINGTON, DC – For those who hadn’t yet figured it out, the price of having a US president who disdains expert opinion and who is impulsive, mendacious, not very smart, disturbed, uninformed, incurious, incompetent, intemperate, corrupt, and a poor negotiator became irrefutably clear in recent days. Three large developments from last Wednesday through Saturday unnerved even some of Donald Trump’s Republican protectors, who had rationalized that, after all, he had cut taxes (mainly on the rich and corporations) and put two conservatives on the Supreme Court bench. But the dangers of having such a person in the Oval Office were now becoming harder to ignore. All three big events were alarming, and on a bipartisan basis: each was damaging to US national interests, and each was avoidable. Worse, because they came in rapid succession, they created the sense that now (as opposed to previous alarms) the Trump presidency was truly spinning out of control. 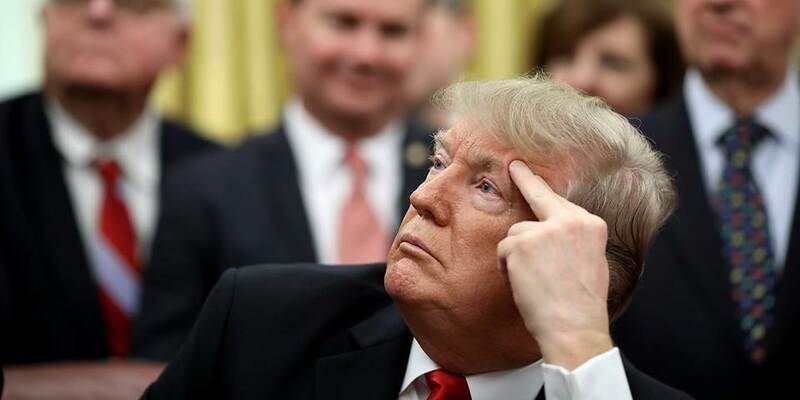 On the morning of Wednesday, December 19, Trump tweeted that ISIS had been defeated and that the US would, therefore, withdraw its troops from Syria. The decision came as a bolt from the blue for all but a small number of government officials – every one of whom had tried to dissuade him. Key members of Congress hadn’t been informed, much less consulted; nor had America’s allies, some of whose troops have been dependent on the presence of the US military. Major foreign policy decisions simply aren’t made that way: allies are consulted beforehand; relevant congressional figures are at least informed before any such announcement. Such precautions are about more than good manners: an administration might learn something as it consults and informs. The decision was immediately and widely denounced. Trump’s usual Senate ally, Lindsey Graham, said, “ISIS has been dealt a severe blow but are not defeated. If there has been a decision to withdraw our forces in Syria, the likelihood of their return goes up dramatically.” The withdrawal, to begin immediately, abandons the Kurds, whom the US had been protecting from Turkey, and preempted a planned joint attack on ISIS. The withdrawal leaves Syria to the mercies of Bashar al-Assad, Russia (Assad’s patron), and Iran. The only foreign leaders who welcomed the decision were Turkey’s authoritarian leader, Recep Tayyip Erdoğan, and Russian President Vladimir Putin. It later emerged that Erdoğan had persuaded Trump, who had said earlier, as a general proposition, that he wanted to withdraw US troops from Syria, to do so). Then came the news that Trump had also decided – again with scant consultation – to withdraw half the US troops in Afghanistan, despite the US being in the midst of negotiations with the Taliban. The announcement of the sudden withdrawal from Syria was too much for defense secretary James Mattis, the most respected member of Trump’s cabinet – though it was far from the only provocation. On Thursday, Mattis, widely seen as the only hope for reining in Trump’s most dangerous impulses, stunned almost everyone by resigning. His eloquent resignation letter made clear that he objected not just to the Syrian blunder, but to a pattern of behavior: Trump’s confusion of allies and opponents; his willingness to abandon friends, such as the Kurds; and his trashing of alliances, such as NATO. Mattis’s friends explained in television interviews that what most troubled the retired four-star Marine general and defense intellectual was not just that he could no longer affect policy, but also that his remaining in the cabinet was taken as an affirmation of Trump, a position he could no longer bear. Even that doughty loyalist, Senate Majority Leader Mitch McConnell, issued a statement on Thursday afternoon that he was “distressed” by the departure of Mattis (a significant sign, many believe, of McConnell’s private worry about Trump’s effect on the Republican Party.) Members of Congress expressed outright fear of a Trump presidency without any guardrails. The list of departures from Trump’s administration is unprecedentedly long. Though some were forced out for blatant corruption (and shouldn’t have been hired in the first place), others have been fired because Trump has turned against them, and some left because of the president’s abusive treatment. He screams at subordinates at will and scapegoats them with abandon. At first, Trump treated Mattis with respect and even some affection; but he gradually tired of his most distinguished cabinet member’s almost across-the-board disagreement with his policies. The wall is very unpopular among the public, and only Trump’s most devoted followers view it as the answer to illegal immigration (or drug smuggling). But by using it to cultivate his political base – at most around 35% of the electorate – Trump could corner himself. In a televised White House meeting, he fell into a trap set by Democratic leaders by angrily insisting he would be “proud” to own a government shutdown if he couldn’t get billions to fund at least part of the wall. Under strong pressure from right-wing media figures to keep his promise, Trump made and abandoned budget deals until time ran out. So, just before Christmas, hundreds of thousands of federal workers – real people all over the country with bills to pay – were either furloughed or forced to work without knowing when they would be paid. And Trump is now a hostage in the White House, because even he understands that it would be terrible “optics” to be seen playing golf and hobnobbing with his rich friends at his Palm Beach estate while, just before Christmas, government workers were idled. But while Trump must figure out how to climb down from his fanciful wall, so far he has ratcheted up his pettiness, removing Mattis two months ahead of schedule and tweeting insults to politicians who have criticized his recent blunders. His mood is reportedly fouler than ever, and the holiday season has become suffused with an increased sense of danger emanating from the White House. Elizabeth Drew is a Washington-based journalist and the author, most recently, of Washington Journal: Reporting Watergate and Richard Nixon's Downfall. California Governor Jerry Brown inherited a $27 billion deficit from Arnold Schwarzenegger eight years ago. This month he’s leaving his successor a $13.8 billion surplus and a $14.5 billion rainy day fund balance. Pretty good right? Approximately 48 other governors would kill for those numbers. Unfortunately it’s all a mirage. California, as home to Silicon Valley and Hollywood, lives and dies with capital gains taxes. In bull markets, when lots of stocks are rising and tech startups are going public, the state is flush. But in bear markets capital gains turn into capital losses and Sacramento’s revenues plunge. Put another way, the state’s top 1% highest-income taxpayers generate about half of personal income taxes. When their incomes fall, tax revenues crater. That’s happening right now, as tech stocks plunge, IPOs are pulled and billion-dollar unicorns endure “down rounds” that shave major bucks from their valuations. So if this is a replay of the 2008-2009 bear market, expect California’s deficits to return to the double-digit billions. Can we prevent the LAUSD budget crisis from taking down the California state budget? (SGVT) – Even as its teachers consider going out on strike, the Los Angeles Unified School District’s budget clearly is in crisis. The problem is so big it might wipe out whatever surplus the roaring California economy might generate in 2019 – and then some. The LAUSD just released its Comprehensive Annual Financial Report, or CAFR, for the fiscal year ending June 30, 2018. As I have been predicting, the LAUSD’s new CAFR doubled the size of its negative Unrestricted Net Position (UNP), the best number I’ve found for judging financial soundness. The reason was, for the first time, municipalities are now required to include unfunded liabilities for retiree medical care on their balance sheets. The unrestricted net deficits for 2016 and 2017 were $10.5 billion and $10.9 billion, respectively. For 2018 it is $19.6 billion, or 80 percent higher! That’s what a $15 billion obligation will do when it’s recognized. In bureaucratic language, the CAFR itself explained, the negative UNP “is largely the result of net other postemployment benefit (OPEB) liability and net pension liability for various retirement plans.” They blamed this transparency on the recent accounting standard they just implemented. (Wall Street Journal) – Democratic dominance means they now have to pay the union bills. Democrats received a mixed blessing in November when they seized complete control of state governments in California, Connecticut, Illinois and New York. They now own responsibility for fixing the dysfunctions of liberal governance even as the left wants more spending and taxes. Anti-Trump furor helped Democrats retake the governorship in Illinois and augment legislative majorities in California, Connecticut and New York. Democrats picked up 12 seats in the Connecticut House and six in the Senate where control is split with Republicans. Democrats in New York flipped eight Senate seats and won a legislative majority for only the third time in 50 years. With legislative supermajorities, liberals in California can raise taxes without GOP votes and in Illinois place a progressive tax on the ballot as unions have long wanted. Democrats campaigned on more spending—for schools, roads, child care, you name it. But Illinois and Connecticut are spilling red ink while the progressive tax-and-spending structures in New York and California are profiting from the Trump economy while storing up future trouble. Illinois is forecasting a $1.2 billion deficit next year and has accrued $7.5 billion in unpaid bills despite a $5 billion income and corporate tax hike in 2017. Pensions consume 25% of state revenue, up from 10% a decade ago, yet are still only about 40% funded. Chicago is leaning toward insolvency as pension costs have doubled in a decade. While New York’s fiscal problems are less glaring, its taxpayer flight is also ominous. The state lost a net $8.6 billion in adjusted gross income in 2016 as high-earners fled for lower-tax climes. Growth has stalled upstate—half of upstate metro economies have contracted over the last five years—as residents have moved. New York City has benefited from its finance industry and cultural attractions, but even its economy has grown only half as fast as the rest of the country. Roads and subways are in disrepair as politicians have neglected public works to boost pay and benefits for their union friends. New York, by the way, is the other state that lives and dies with stock prices. In a bear market, Wall Street lays off tens of thousands of analysts, investment bankers and traders, who promptly stop paying taxes. The last recession/bear market was tough on state budgets. The next one, with debt much higher and unfunded liabilities off the charts – will be brutal.